Forests build soil. Ours is losing it! What do invasive earthworms have to do with it? 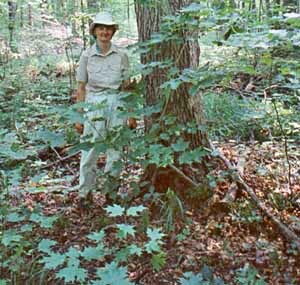 In the early 1990s, the Macoun Field Club began picking individual trees for study in a 10-acre hardwood forest in the Macoun Club’s 800-acre Nature Study Area in Stony Swamp, in Ottawa’ western Greenbelt. 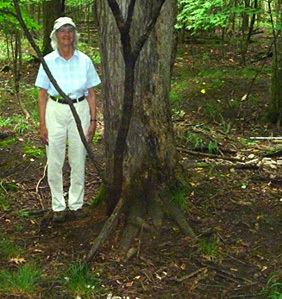 Leader Barbara Gaertner chose a mature Sugar Maple and had her photograph taken beside it in the summer of 1994, at left in the pair of pictures immediately below. She visits often and makes notes. In the summer of 2013, seeing how badly things are now going wrong, we took a repeat photograph (at right). The passage of time — 19 years — is evident from the way the leafy sprout that had previously screened her from view has grown into a tall, dark sapling. The two changes that dominate these images are first, the disappearance since 1994 of the green shrubbery, and second, the loss since 2005 of leaf litter on the forest floor. Between 2001 and 2005, an overpopulation of White-Tailed Deer browsed away all the shrubby growth and wildflowers. Then, from 2006 onward, a population explosion among earthworms has eaten up every fallen, dead leaf off the ground. Both are ecological catastrophies, but of the two, we fear that the worms will turn out to be the more dreadful. That is because the deer have only removed the youngest generation of trees — about 25 years worth. If the deer go, the forest, whose large trees are still producing good seed crops, should be able to recover in another 25 years. The worms, however, have eaten not only the leaf litter, but the layer of decaying leaves and much of the black humus layer — more than 100 years’ worth of soil building. The ground has been literally melting away. The results are clear in the following pair of images from another mature hardwood forest (at White Lake, Ontario), an hour’s drive west of the first. At left is a Sugar Maple about 10 inches in diameter, rooted in soil still protected by a worm-free mat of dead leaves. At right, a somewhat smaller White Ash in the same woods, whose roots have become exposed following a localized invasion and proliferation of earthworms. The picture at left shows the natural state of the forest floor under a canopy of deciduous trees. 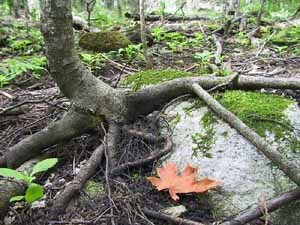 The leaves that fell last autumn were pressed flat by the winter snowpack, but can still be pulled up one by one. 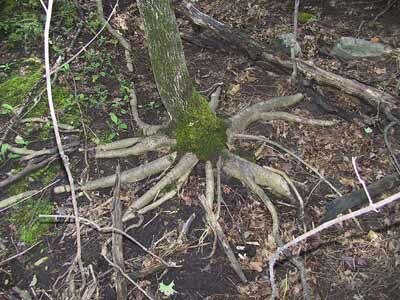 Beneath them is an inch-thick layer of leaf fragments that is bound together by fine rootlets and fungal threads. That is called leaf mould, or duff. Beneath it is an inch-thick layer of black organic soil — the humus. You have to dig through all of that with your fingers before you hit mineral soil. This forest floor is soft and springy underfoot. 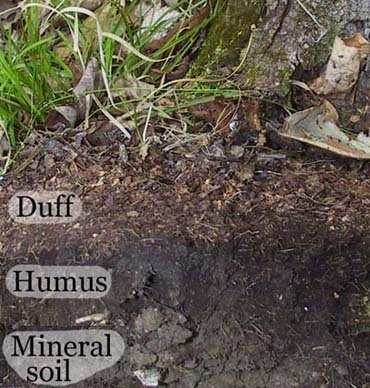 In the picture at right, the soil has retreated from the roots, and the remaining ground is solid and unyielding. Why do we blame earthworms? At least three or four things are going on when earthworms are damaging a forest. The leaf litter gets eaten up. The duff layer disappears. The humus disappears. And some organic matter is spread downward into the mineral soil. Different species seem to be responsible for these several components. To begin with, we can be sure that the species known as the Dew Worm (Lumbricus terrestris), is what is stripping away the leaf litter because we have watched them in action and therefore know the distinctive evidence they produce. These large worms, typically eight inches (20 cm) long, reach almost full length out of their burrows, grab a dead leaf, and drag it back to the burrow opening. There they can eat it in safety, leaving only the leaf-stem, or petiole. They do this over and over, until there are no leaves left within reach. But Dew Worms are only one of the half-dozen species we’ve identified in our Study Area, and the role of the others in the destruction of the forest floor takes place entirely out of sight. To figure out what they do, we’ve placed several individuals of each species in its own jar filled with samples of the different soil layers from a healthy (worm-free) forest. In these experiments, the Red Marsh Worm, Lumbricus rubellus, ate holes through both the layer of mouldering dead leaves under the leaf litter, which is known as duff, and the black organic soil called humus. The Pasture Worm, Aporrectodea turgida, consumed only the humus. It is able to do this even in the saturated soil under springtime meltwater ponds. In their natural state, northeastern forests slowly build soil in a process that is illustrated by the profile at left. Each autumn, leaves fall and become matted into a moist mass. In a process that takes years, a succession of small insects and other invertebrates, together with fungi, slowly eat their way through this mass, successively breaking down the leaves’ tougher components to the point where they can be used by other detritivores. The duff layer is rich in mites, springtails, nematodes and millipedes, as well as their predators, such as salamanders, spiders, and parasitic fungi. Eventually, black organic soil — humus — is produced at the bottom. Earthworms, in contrast, chew their way through the litter and duff in a single pass. Gardeners and composters prize this speedy decomposition. But in the forest, the worms leave nothing for other forms of life, except bacteria. Within a year or two, the structure of the forest soil becomes crumbly, and it is palpably drier. Earthworms have had good press as soil builders ever since Darwin wrote about them, and people are reluctant to believe anything bad about them. The first thing we must do is learn to see for ourselves what is going on. Where worms have already invaded and caused damage, we have to learn to recognize the signs: the petiole piles, the absence of important layers from the forest floor, the shrinkage of soil away from fixed objects. By way of example, in this photo, the Sugar Maple roots running over the small boulder show that the whole boulder was once covered by soil. The whiteness of the exposed rock shows how recently it was buried, and the moss that caps it shows that a few years have passed since its top, at least, was exposed. The mass of fine rootlets under the sapling show that the process is on-going. No way of dealing with the worms is yet known to us. All photos donated or provided by members and leaders, past and present. Created August-September, 2008. Revised slightly in 2015. Coding revised in June 2016.